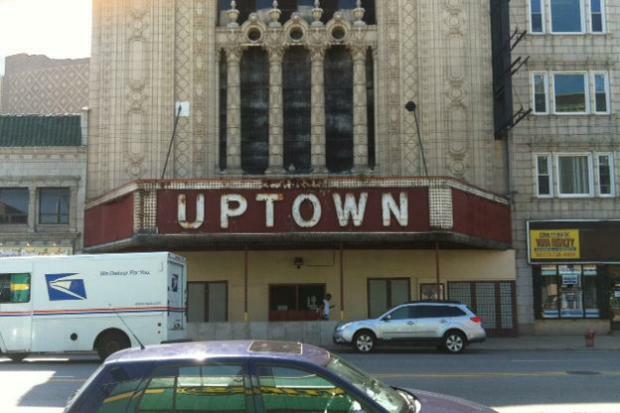 UPTOWN — The Uptown Theatre has yet to undergo rehab and open its doors again, but you might be able to own a former part of the defunct but historic theater palace — for about $15,000 — thanks to eBay, of course. A three-piece light fixture set is open for bidding on the auctioning website, starting at $14,850. The seller's account name is "artbycarlo," and the man behind it is Christopher Carlo, one of the former operators of the Music Box Theatre credited with the venue's revival in the 1980s. The eBay page selling the antiques said the "three exquisite pieces," made out of ruby pink glass, adorned with "original molded gilt-bronze flowers," and lined with white milk-glass, were made by the Victor S. Pearlman Company of Chicago for the Uptown Theatre in 1925. Once fitted with light bulbs, the antique set "burns orange gold," according to the seller. The set includes glass inserts made by Steuben, according to the seller. The glass manufacturer shut down in 2011 after more than 100 years providing high-quality glassware to buyers with deep pockets and exquisite taste. Carlo said in an email that he bought the antiques from former Uptown Theatre owners Kenneth Goldberg and Lou Wolf "in 1985 when they were trying to raise [money] to pay the heating oil bill," at the theater. Wolf, a convicted arsonist and tax dodger, was named "Chicago's Worst Landlord," by Chicago Magazine in 1989. He and his partner Goldberg owned the theater from the '80s to mid-'90s and did little to revitalize it, as the Uptown sat vacant and deteriorating through years of disuse. Carlo's Ebay seller page said the light fixture set had been used "in three of my foyers for the past 20 years," at venues Carlo was involved with. "They were designed for theatre auditorium decoration and direction; not light which would interfere with the movie screen," the page said. Nobody had offered a bid as of Saturday morning, with two days left in the bidding period. For more information about the fixtures, click here.